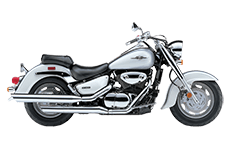 Suzuki's Intruder Boulevard C90 series motorcycle is a powerful machine for riders who know how to rip down the open road. There comes a time when every owner needs a set of saddlebags for on-bike storage, but finding the right pair is sometimes a challenge. We offer the Viking Bag collection of saddlebags made specifically for this model of Suzuki, and you get more than just a place to secure your belongings. You get a true luggage compartment built for a lifetime. We want your shopping experience to be positive and completely molded to your personality, so we're offering our assistance to you in any way. We also provide a 30-day money back guarantee with every purchase, so you can try these bags out before you make the final commitment. If you want a different size or shape, just let us know and we'll take care of the rest. That's our promise to you!